I posted a picture in a thread about bad AI and a few people were interested in the carset I was showing. I'm not sure what kind of permissions that would be required to share the set, but if it seems okay to people here I wouldn't mind releasing it. I've always been a "career mode" kind of player, I like the idea of inserting myself into history and playing more than just a race or one single championship. It seemed possible to make a 'mock' 1964 season using the 65 mod because the cars look very similar. I could definitely use some help in making it more accurate though! Obviously all of the correct cars for the 64 season are not available, and I don't foresee myself editing carshapes anytime soon, so It's going to be an interesting time trying to make all of the cars with the 65 mod. 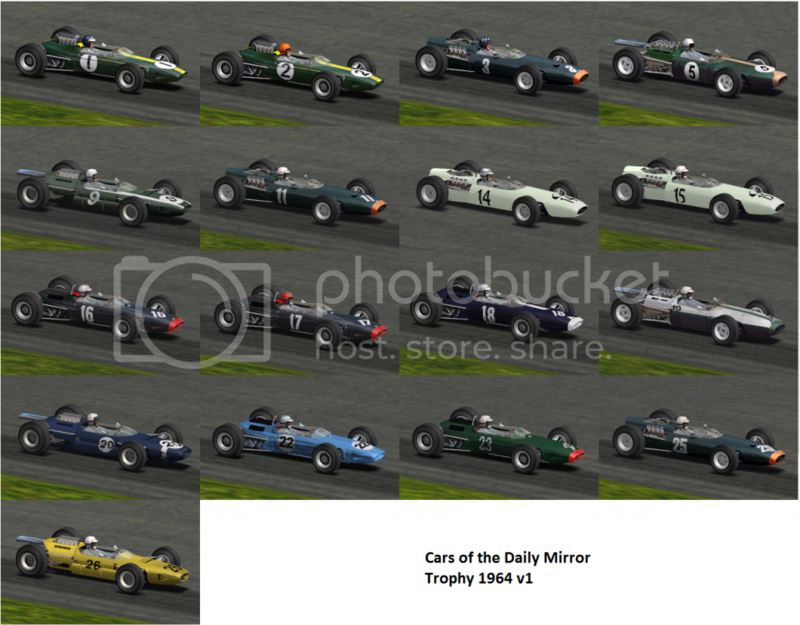 Shown here are the cars for the first (nc) round of that year, the II Daily Mirror Trophy. These are the only cars I have done so far, but I will post more here as I work on them! Again, most of this is just editing existing work! I did not by any means do most of the texturing, just editing! WARNING: I am not the most skilled painter, but these cars aren't extremely difficult to do so I think I can get away with it. Edited by jxeboy, Jan 04 2015 - 06:22 PM. Have you seen this for 1964 ? I use them quite often when driving a career 1964-1971. Edited by davef, Jan 04 2015 - 07:42 PM. A good collection of cars to get started with. I saw the pre-Sim versions race, and our artists have done a great job of capturing the darker colours which continued to race in later years. I notice the lighter cars have been toned down, so as not to dominate the pack. Check historic data to see if the blue was paler. And if 26 was in Belgian colours, it would have been a lighter yellow. Inet digitals do not always reproduce colours well, so comparison with a known car in the same shot is helpful. And protocol suggests you try to contact authors, and give credit where possible. If your project is good, I imagine most would be happy to see their work re-issued. I'm sure i remember others in past threads also showing their versions of 1964 cars, but i can't find the thread. Maybe its my imagination. I'm also mainly an 'Offline' racer who likes to insert myself into a historic grid with all the correct names and cars present, so i get where you're coming from. It certainly makes a real difference with your superb GPL Y-Tube videos. I'm also guessing that all this hard work could be used toward for any future 'full 1964 Mod', which would obviously be years and years down the line if the Modders also felt the urge, but that said, i appreciate any work anyone does for this brilliant sim, so well done. I also have a Cooper T73 made by Rudy Dingemans sitting on my HD if it helps. It was done a long time ago 2005. Edited by Brian Speake, Jan 05 2015 - 04:39 PM. Thanks pavel! I know this thread, it's where i got the beginnings of my drivers.ini from. There are a lot of good race programs posted in that thread too. Ahh, it would be fascinating to see the Cooper T73, as done by Rudy. Nice also to see the BRP Mk I here; BRP were denied entry to the F1 Constructor's Association for 1965, and thus could not get start money to survive.. makes me think of today's new teams going to the wall, after not being given any money by BCE . Of course, it is the NART Ferrari that I remember as the previously available '64 skin. I like that Tommie uses them as his '65 Ferrari ! How many of the Tasman 1964 or 1965 skins overlap with the 1964/65 seasons? That could cut down on the editing. I always thought a 'GPL career' overlaps well with Jackie Stewart (1964 Rand GP in a Lotus 33, then 1965 F1 - Can Am '71, like in Jake's YT series), but it's always nice to have more options (Cheers guys! ), including from Tasman 1964-. We could imagine, for instance, what if Timmy Mayer hadn't tragically died at Longford in the last round? He could have had a long GP career with Bruce McLaren, who gave that memorable quote at his eulogy. PS. Would you want to include Giancarlo Baghetti in the #12 Scuderia Centro Sud, Jake? It looks like his Engine blew up in practice, thus no race appearance. This would make an 18 car field, despite some of the 'big teams' being without their second drivers (Gurney, Ginther and Phil Hill), and Ferrari absent (Surtees/Bandini), replaced by the privateers (including the Scirocco SP #26!). Edited by Iestyn16, Jan 06 2015 - 12:05 PM. Once upon a time (2006) I created some files for racing the 1964 season. My idea was that the BT7 is a car of 1964. Using this car as the one and only player‘s car one can simulate a 64mod without creating a new mod. and I made some changes on cars inside the full65 folder. I cannot create a carset, as a result these files are nothing more than very bad aproximations of the reality. I distributed some existing GPL sounds into a sound folder. The „simulation“ once worked on a mixed 65/67 installation. I tried the files including some changes with my new (2015) installation all in one gem+. It works, but I think the files should be looked over by someone who knows well the 65mod and gem+. Are You interested in my files? They were made by someone (me), who only partly knew, what and how to do. Of cause there should be created a 64 carset. Moreover I do not know how to change writings on GPL pages. Another work that should be done by someone.